Episodes from the life of Elizabeth I, Queen of England (1533-1603), focusing on her ill-fated love affair with Robert Devereux, Earl of Essex. 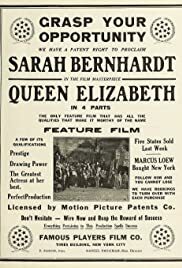 Q: Paramount Studios---Was "Queen Elizabeth" Their First Movie? This film is a curiosity. I saw a snippet of it in an exhibition on Sarah Bernhardt and was glad that the whole story was captured on film. The movie is actually the filming of a play, or that's what it looks like, and in that respect it is more 19th Century than 20th, as it shows the acting style of the theater, with no real adaptation at all to the range and variety of film. There are no closeups, for example. No doubt, it could have been much better directed, even at that time there was already a lot more talented work around that would make this material look old fashioned. The attraction here is to see the great Sarah. She is indeed a strong presence, and we perceive she is quite accustomed to being at the center of attention, but we don't at all get a sense of what made her the great actress-legend that she was. I have heard recordings of hers and I understand that the declamation (as taught in the Comedy Française) was a great part of her appeal, which of course we don't get on a silent film. Here her 19th Century interpretation of the Renaissance Queen is very grand, her costume and crown very similar to the ones she used to score one of her greatest theatrical triumphs as the queen in Victor Hugo's "Ruy Blas". Her gesturing is very over-the top Diva, which certainly matches the image of her legend. The surprise is the strong performance of Robert Devereux, who looks very attractive, virile and decisive in the role, though not particularly expressive. Her death scene is based on historical fact, as the Queen refused to go to bed during her last days and slept on cushions in the floor. However the death itself was more comical than tragic. I think this has largely to do with the fact that what looks good on theater does not necessarily translate well in the camera, specially a steady, primitive camera that is merely recording and not actively integrated in filming. As a curiosity though, and as a record of 19th Century style, aesthetics and theater, it is a unique testimonial and we are lucky that it has survived. As a precursor in the creation of "star' image, and the development of modern iconography of glamor, Sarah also holds a special place. Her identity as an iconic emblem of Parisian Belle Epoque is part of her legend and it also served as inspiration for the paraphernalia, wardrobe and decor surrounding early movie divas, such as Theda Bara and Gloria Swanson, all of which ultimately influenced the aesthetics of kitsch and the appreciation of camp in later generations.